Now people are able to stay connected all around the world at low rates thanks to technological advances. VoIP is a technology which is increasingly being used by many individuals and organisations to make their communication process easier. It uses your existing internet connection to connect you to people, allowing you to avoid paying high charges by landline operators for international and mobile calls. To ensure you keep into touch with your friends and family with VoIP, there are a number of different options you can take to make use of the service. You can buy an IP (Internet Protocol) phone that plugs into an Ethernet connection or connects through a wireless LAN, or buy an Analogue Telephone Adapter (ATA) that connects to an existing phone to the internet connection. Another option is to buy a headset with microphone and connect it to a PC with VoIP software, also known as a 'softphone'. All of these products are easily available online. A VoIP call works through the hardware or software converting your voice into computer readable data. This data is then transported over the internet, where it is converted back into speech for the recipient. Setting up a VoIP is just a case of plugging in the necessary equipment. A good service provider will provide detailed instructions as well as any software and hardware. When looking for a service provider for you and your friends to use, helpful technical support and excellent customer service skills should be top of your agenda. Checkout online forums of different providers to get the reviews of some of the customers. 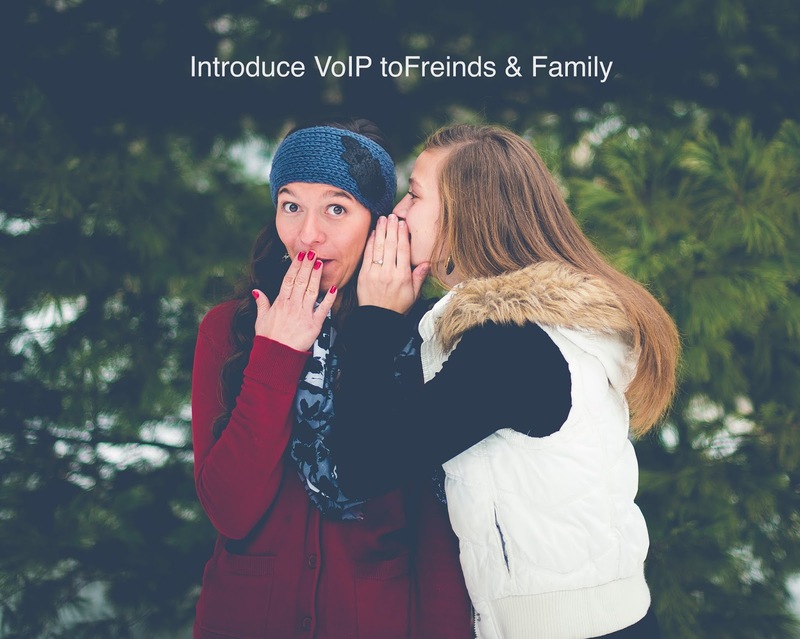 The beauty of getting your family and friends connected with VoIP is that the calls are completely free. If you purchase the hardware adapter, this can be unplugged and taken with you. The device allows you to keep in touch with loved ones in over 45 different countries. Once you are setup on a VoIP service, there are many features for you to enjoy. Traditional phone line features are available such as call forwarding, call waiting, and caller ID. VoIP also offers features that are either unavailable on traditional telephone systems, or would be costly extras. A web-based management system is available which allows you to access your voicemail anywhere in the world, from your email address. Three-way calling is another option which allows you and two other friends or family members to have a catch up at the same time. The reason all calls using VoIP aren't free is because when calls are not from computer to computer, the VoIP service provider is charged when connecting to a public phone system, to both landlines and mobiles. The VoIP service provider will have to pay the landline or mobile company to carry a VoIP call a non-VoIP user (known in the industry as 'termination charges'). When making calls to these lines, costs are generally lower than conventional call charges, making VoIP an effective solution to making all your phone calls.